New Delhi Sep 16 (IANS) What is touted as the world s largest healthcare scheme - Ayushman Bharat-Pradhan Mantri Jan Arogya Yojana (PMJAY) - will benefit over 500 million (50 crore) people which is more than the combined population of the United States Canada and Mexico Union Health Minister Jagat Prakash Nadda said. The scheme to be launched by Prime Minister Narendra Modi on September 25 will provide a cover of up to Rs 5 lakh per family per year for secondary and tertiary care hospitalisation. 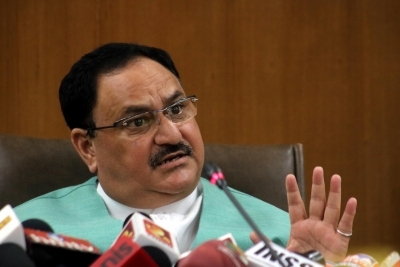 "This is a very bold decision taken by Prime Minister Modi and this will ensure that poor people will not have to bother any longer for the cost of healthcare facilities " Nadda told IANS in an interview here. He said that 30 states and union territories had signed the memorandum of understanding and have started working on implementation of the mission. Maharashtra and Tamil Nadu have also joined the scheme recently. A pilot project of the scheme was launched in 22 states and union territories. The ministry has received 15 686 applications for hospital empanelment including private hospitals so far. "Majority of the people (who will now be covered under the Ayushman Bharat scheme) could not afford the healthcare and hospitalisation. Things will change for a big population of the country " Nadda whose ministry has been preparing for the launch of the ambitious healthcare scheme said. "Over 10.74 crore vulnerable entitled families (approximately 50 crore beneficiaries) will be eligible for these benefits. PMJAY will help reduce catastrophic expenditure for hospitalisation which impoverishes people and will help mitigate the financial risk arising out of catastrophic health episodes. When fully implemented PMJAY will become the world s largest fully government-financed health protection scheme " Nadda said. As per the health ministry estimates 62.58 per cent of the population in the country has to pay for their own health and hospitalization expenses and are not covered through any form of health protection. Each year 4.6 per cent of the population is pushed below the poverty line as people meet their healthcare needs spending large proportion of their income and savings borrowing money or selling their assets. Ayushman Bharat aims to cover prevention promotion and ambulatory care at primary secondary and tertiary level. The scheme envisages creation of 1 50 000 health and wellness centres which will bring health care closer to the homes of the people. These centres will provide comprehensive primary health care covering both maternal and child health services and non-communicable diseases including free essential drugs and diagnostic services. The second component of the scheme is the PMJAY which provides health protection cover to poor and vulnerable families for secondary and tertiary care. The National Sample Survey Organization (NSSO) has found that 85.9 per cent of rural households and 82 per cent of urban households have no access to healthcare insurance/assurance. More than 17 per cent of Indian population spends at least 10 per cent of household budget for health services. The PMJAY primarily targets the poor deprived rural families and identified occupational category of urban workers families as per the latest Socio-Economic Caste Census (SECC) data for both rural and urban areas. "There is no cap on family size and age as well as restriction on pre-existing conditions (to avail the new scheme). It will cover hospitalisation cost from inpatient care to post-hospitalisation care. Everything will be cashless and paperless " Nadda said.